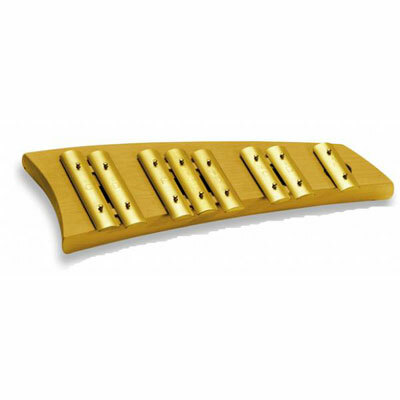 These Glockenspiel from AURIS consist of a straight base of maple wood and high quality brass bars, that are tuned precisely. Auris uses high quality precision tuned brass bars, which have a lovely bell-like sound. Packed in a box with 3 different mallets. Size: 30 x 12 x 4 cm. 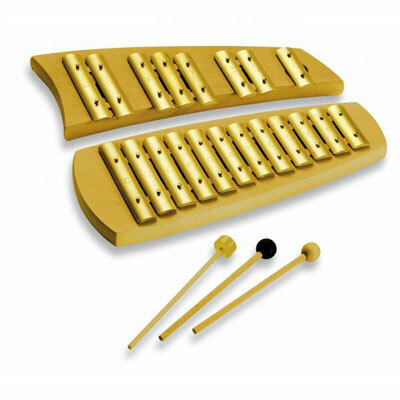 These Glockenspiel from AURIS consist of a straight base of maple wood and high quality brass bars, that are tuned precisely. They have a lovely bell-like sound with a short reveberation. All instruments incl. mallets, packed in a single box. The Glockenspiel exists in many different forms around the globe and belongs to the family of the Idiophones. Many of them can be found in Southeast Asia, for example the Gender from Bali. A relative of the Lithophone, a stone xylophone, from the Stone Age was found in Vietnam. The musicians in Togo took flat stones of different sizes and used smaller stones as beaters. Auris uses high quality precision tuned brass bars, which have a lovely bell-like sound. Packed in a box with 2 different mallets.